May – Holes – sometimes the spaces between stuff are what makes a garment special. 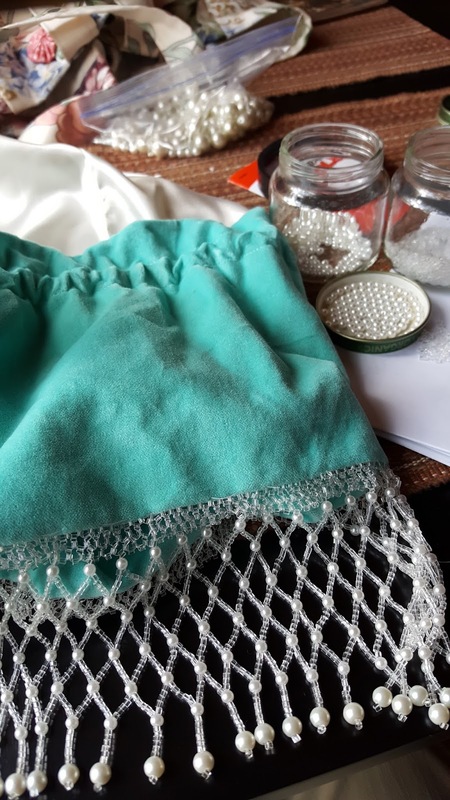 Make a garment that is about holes, whether it is lace, slashing, eyelets, etc. Costume College 2015 was extraordinary! It was my second time attending and my first time teaching which was incredibly fun. I met the most wonderful people and learned so many new techniques. One of my favorite instructors was Kristin Stonham. Although we didn't know each other before Costume College, we apparently had some learning interests in common as Kristin took my Ribbon Flower class (see the gorgeous rose and leaf she created? 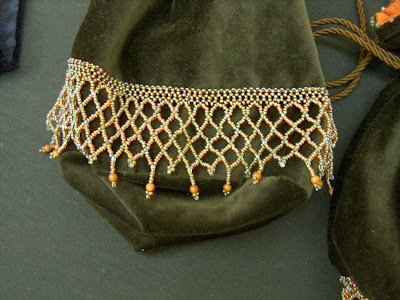 ), and I took both her Beaded Reticule and Beginning Embroidery classes. 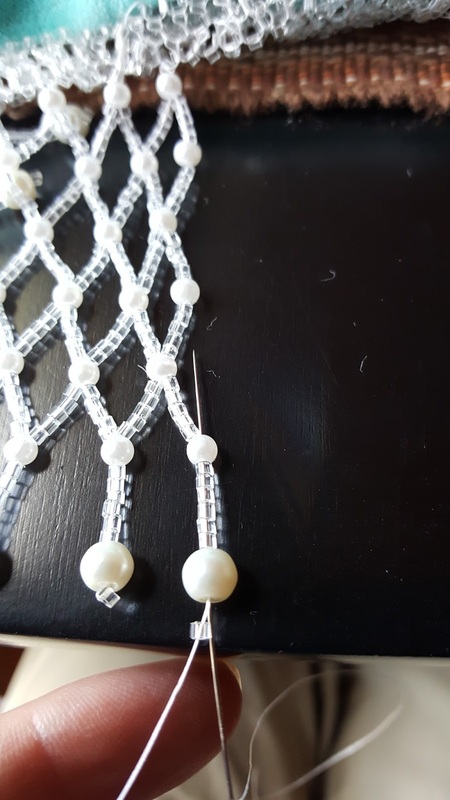 Kristin provided us with a completely sewn reticule in our choice of colors with complimentary seed beads, pearls, beading thread, beading needles, and instructions. By the end of our session with Kristin I had completed my first row of closely netted border and was convinced I was the slowest beader in the world. Fast forward to the Historical Sew Monthly Challenge #5 - Holes. Since I travel for work and often don't have the room or time for sewing, my beaded reticule quietly sitting in last year's unfinished project pile became the perfect answer. The holes of the closely netted border and the larger holes of the loosely netted fringe and the zillion holes in the seed beads and pearls all work to create a gorgeous trim for the velveteen reticule. 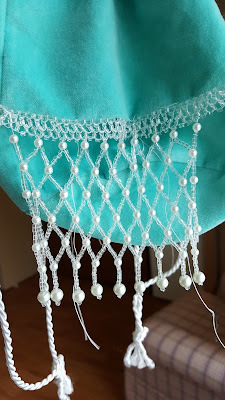 Kristen has used these techniques for a beaded reticule and a velvet scarf fringe and they are both incredibly lovely! ...and then begin the loosely netted fringe. The fringe is looking beautiful! I'm still the world's slowest beader and as my work assignment is finished I have now moved my project to my game table in my living room. Finished and fabulous! I love the dangle, the sparkle, and the way the velveteen looks through the holes of the fringe. I will wear this with a 1920s dress with other pearl accessories. How historically accurate is it? 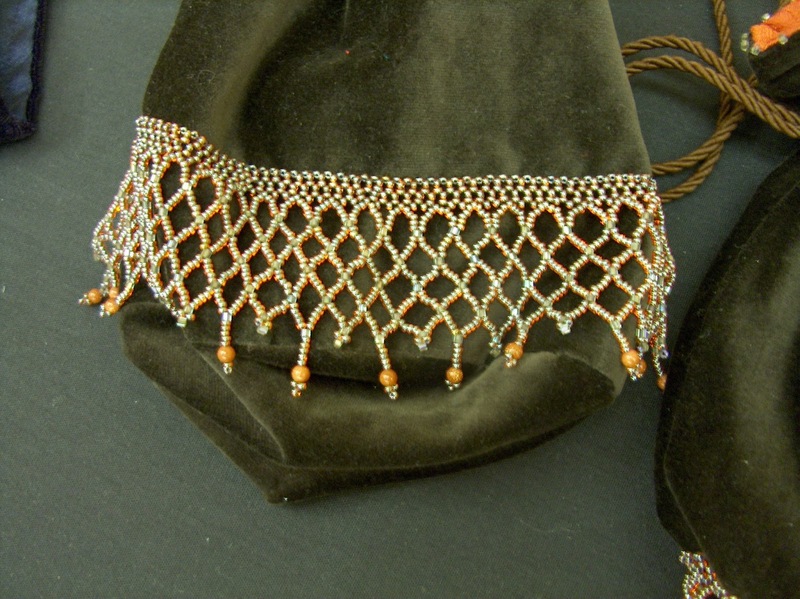 The beaded reticule was very popular during this period. Thank you for your wonderful teaching, Kristin! Really beautiful work! I love the colour too - that, and all of the gorgeous pearls in the photos, reminds me of Tiffany's. I can imagine that it will look fantastic with a 1920s dress! Thank you, Ellie! I love the color and the pearls too!